This is, overall, a nice piece of art. But I would like to point out that the emotions are a little blatant. Like when Chara starts smiling, their isn't enough muscle movement in the face. And, if it's supposed to represent insanity, maybe you could add a little eye twitching motion? Oh wait, I forgot what storyshift was for a second. Sorry 'bout that. But otherwise, if she IS raging, she should still have a but more muscle movement to express her emotions. People can't animate like that all the time. Come at me! I dare you. Why would you do that to Rei!? A fantastic job like always ! Yes very wonderful indeed! Please do more animations! I like the shock blank look Chara has and that it shifted to crazed yet grieving (for her brother) look. Frisk has definitely flipped Chara's switch by murdering the adorable cinnamon roll. I love it it is so awesome!Good job on this GIF. Chara is going to show Frisk who's in control. who do you refer with? 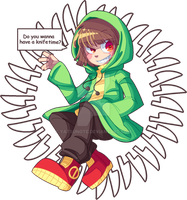 chara or frisk? oooh i saw this! i love it!